Jessi Zazu, the former lead singer of Nashville country-garage band Those Darlins, was diagnosed with cancer seven months ago. While initial treatments over the summer seemed to be effective, the cancer has since returned and spread, forcing further medical care. 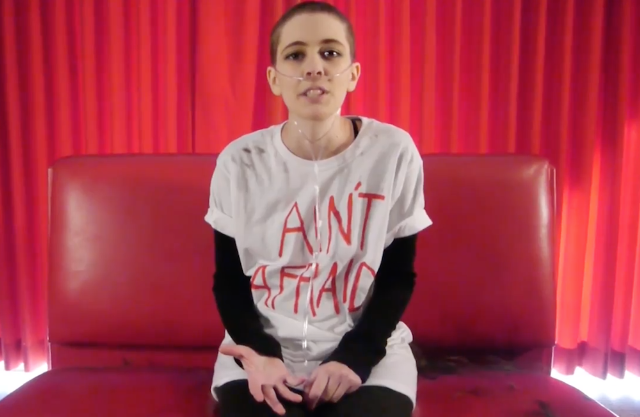 To help with the costs, Zazu has launched a fundraising website at YouCare and is selling “Ain’t Afraid” t-shirts. To help pay for chemotherapy, Zazu is hoping to raise $30,000 via YouCare. Zazu also released a video statement about her diagnosis during which a friend shaves her head in advance of her chemo treatments, which are set to begin in a couple of weeks. “I just want everyone to know that I am a fighter and that I will never give up,” she said at the video’s end. Watch it below.